Throughout the 20th-century, we've come up with crazy ideas for reinventing books, ones that make our phone and tablet readers seem almost modest. 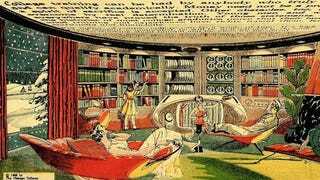 From books projected onto the ceiling to reading Ferris wheels, here are some of the last century's strangest and most innovative book proposals. "A sample prepared by the inventor illustrates the size of the type. He had the entire first volume of Mark Twain's 'Innocents Abroad', a book of 93,000 words, prepared into a small pamphlet of only thirteen pages, three and three-quarters by five and three-quarters inches with wide margins." – according to Popular Mechanics, July 1926. The February 17, 1962 issue of the Sunday comic strip Our New Age, shows an online library. ARPANET was only started seven years later, so the prediction was really ahead of its time.